A mistake gone terribly right !! Last week my friend and fellow flea marketer pal, Janet, who by the way collects and sells the best pink everything and shabby chic, called me to ask if I wanted to go to the Flea market/Antique Extravaganza in Kutztown last Thurs....well, are you kidding?!! A fun day out in beautiful weather hunting for finds...you bet!! So off we went and had a great time scouting around for our treasures. She looking for pink anything! and me..well, just anything that catches my eye. Well Janet found lots of pink stuff and I found a wonderful vintage cement garniture. It's a basket of fruits and flowers poured into a mold and made for an outdoor garden. I just love it and I put it in my garden where I can see it every day just outside my window. The woman had another which I hope she will part with someday soon. A pair would be the best! 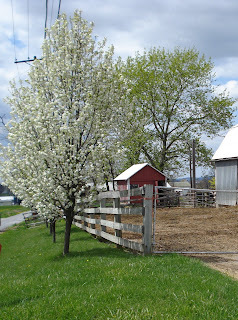 So on the ride home,Janet is driving and I am loving the views, since I don't get to be a passenger in a car all that much and I spot this wonderful bucolic scene of a huge red barn with a field of Holsteins ...all that black and white and red !! Janet is on her cell at this point and she notices I am eyeing the scene. Do you want to stop? She asks..Heck yeah!! So after she makes a u turn these photos are the result. I couldn't get the red barn in the background because that would involve being on a busy highway and I wouldn't be posting this ..if you get my drift!! So that brings me to my baking mistake..kind of! I came home from the long day knowing I had hours of baking ahead of me. So I began as usual. Among other items, I had 4 batches of blondies to make for a coffee shop that needed lots of baked goods for the Shad Festival happening in Lambertville,NJ this weekend. I made two batches and threw them into the oven. While they were baking I decided to get other recipes ready so I could bake kind of assembly line fashion. Well, in my haste I forgot to put the eggs into the next blondies batch. I remember thinking, these don't look like they should! I decided to bake them anyway and they came out to be a really good mistake. They were like a shortbread and actually tasted great with all the stuff I put into them, toasted pecans, chocolate chips, butterscotch chips and coconut. So there you have it! A mistake gone terribly right! The moral of this story...multi tasking is not for (old)..rather, certain older age persons ! I am very excited to report that Saxby's, the coffee house that bought out Bucks County Coffee, will be carrying my scones in certain locations. They are selling cranberry orange, blueberry lemon and currant raisin at this time. It's so exciting to have a large company like that agree to feature a product that I have been researching and testing for quite a while now, not that I am finished "tweeking" ! If you knew me, you'd know I always look for ways to improve a product. Even one I have been working on for a year now! So, I can only hope this is the beginning of a beautiful relationship! 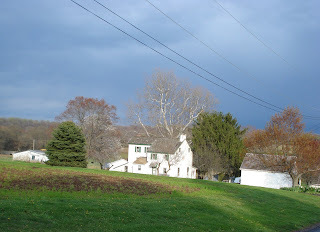 !...And, of course, I always feel the need to include a photo of beautiful Bucks County. This afternoon a storm was approaching and the sky was bright from the sun on one side and very dark on the other. Daniel Garber and Edward Redfield really found paradise here...what a great place to paint!! 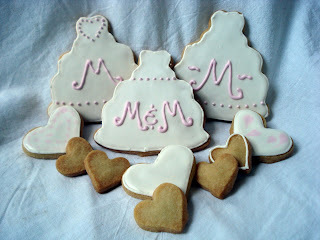 Today was all about my cookie business. 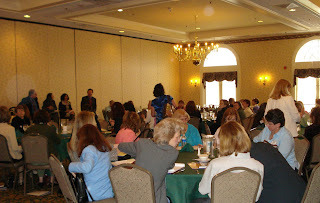 My creative and talented friend, Sharon, who has a staging and redesign business and I went to a Women's Expo, Conference and Power lunch and enjoyed meeting and networking with many other business women. It's always a great idea, especially for a new business, to get out and let as many people as possible know about you and your business. I came away from the event with lots of great ideas and lots of business cards! 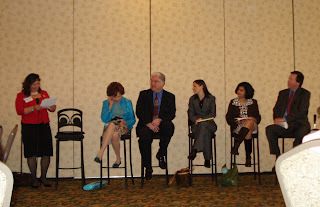 We also had some well known Philadelphia media personalities talking and giving advise...a fun day! Well this Sat. was a much better day than last week..nice and sunny! We all enjoyed being out in the fresh air and seeing many of our customers again. It's great to be back in the swing of the season again, too. It was a long cold winter!! Happy to report everyone remembered, and missed, my scones, which are always a big hit! Working on some new flavors. I have been wanting to try the recipe for these cookies I saw in Cook's Illustrated Jan/Feb 2009 issue for a while now and last weekend I gave it a try. Let me just first admit, shamedly, that I am one of those bakers that never weighs the ingredients. Yup, that's right. Even given that I am a devoted fan of Alton Brown...who weighs everything!! I was still to lazy and, of course, couldn't until I just recently got a scale anyway. Well, I digress. 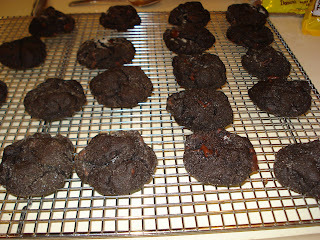 So as I was saying, I made these cookies last weekend and they didn't come out like the photo in the mag. I did everything right!! I weighed everything exactly and they still came out a bit like hockey pucks in the size and shape but they did taste good. And the recipe called for Dutch-processed cocoa powder, which I used. The weird thing is that I recieved a call from a store that is nice enough to carry my cookies, etc. and they actually said they liked them so much that they wanted to order more to give to someone!! So much for my opinion. So, I'd love to hear from others who have baked these to see if it's me ...or what's up with these!? Because CI doesn't allow their recipes to be posted, you'll have to get your hands on an issue. 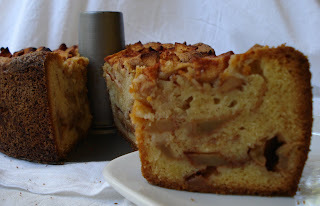 Continuing my muffin and coffee cake baking, I chose a Jewish Coffee Cake recipe I found. I had never made this cake before, which is odd considering my in laws were Jewish and I have family recipes from aunts and cousins for other cakes but not this one! The cake turned out great, nice and moist. I did make one change which was with the apples. I used 5 rather than 6 and I sliced them thinner than the original recipe called for. My reason was that I thought it would make slicing the cake easier. I also had to add some additional time to the baking. A really neat treehouse, perhaps? 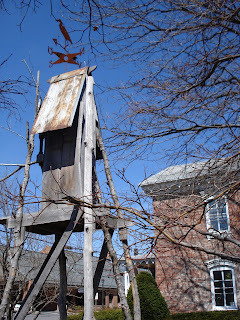 This looked like a piece of sculpture built in someone's yard on our walk today...love the weathervane! The rain finally gave way to beautiful blue skies on Sunday and after a great holiday gathering with family we all needed a brisk walk. Love the white birch trees against the brilliant blue sky. The tiny red dot is my nephew's son Peter. Kids love Easter...don't they?! All that candy! 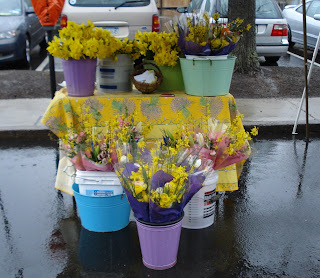 Doylestown Farmers Market...Opening Day a Wet One! Well I guess we all thought( or hoped!) the weatherman would be wrong with the wet and rainy prediction for today but alas...it was just as expected...a really wet and cold one for our first day for the Doylestown Farmers Market. A few of us showed up with hopes of seeing the sun peek out and hopes of seeing customers!! ( See that tiny table on the left?? That's me!) Well, I came home drenched, cold and tired. Since I bake everything fresh and even the morning of the market I turn the oven on at 5 AM to bake my scones, I can honestly say... I need a NAP!! Next week will be great...I just know it !! Happy Easter to all!! I had a request to make cookies for a wedding. Apparently the new "thing" is to have a cookie bar...cookies and milk?? At a wedding!! 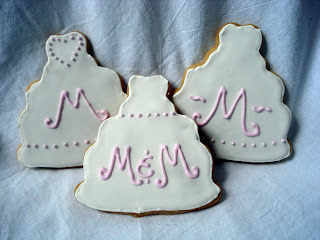 I'm told the groom to be loves cookies!! I think it's a cute idea actually! So I had the thought to do some wedding favors and I called a wonderful and extremely helpful local woman whose beautiful decorated cookies I have admired and asked her if she would give me a lesson in cookie decorating and she was kind enough to oblige! Photos of her work can be viewed on www.flickr.com/photos/haniela/. She taught me well and I had a great time finishing the cookies on my own. Kind of pretty...don't you think ? I was on another quest recently. 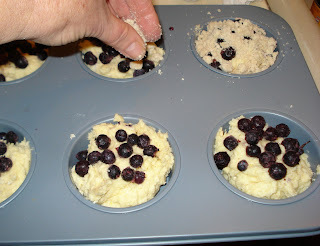 This time for muffins and this blueberry muffin recipe is really great! It was moist and full of flavor and you really should try it! I got the cookbook out of the library but also found it on another blog site. It was from Carole Walter's book " Great Coffee Cakes, Sticky Buns, Muffins & More". I halved the recipe as I usually do if I am testing it out. And I used a bigger and more shallow muffin pan so I would have more room for the topping. Happy Baking!! 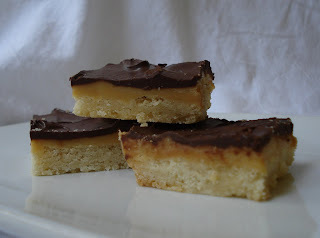 I was watching a new show on food network this morning and a recipe for Millionaire's Shortbread came on so I thought I'd give it a try. It looked like a quick and easy one to whip up and it was! It turned out quite good with the second layer , the dulce de leche, being the longest to make with all that stirring and waiting! I've never made it directly on the stove top before and I swore it was going to disappear in the pan before it turned the caramel color! But, alas, there was some left to spread on top. Butter and flour an 8" pan. Preheat oven to 350. Shortbread: Place flour,sugar,salt in a food processor. Add butter and pulse til mixture resembles peas. Press into pan and bake 20 minutes or til edges are golden. In a heavy pan, combine milk and butter. Slowly bring to boil, stirring constantly til mixture becomes thick and amber color,about 15 min. Pour over cooled shortbread and spread. Let it cool. Melt in a pan over simmering water. Pour over cooled caramel layer and spread. Place in fridge to harden slightly but not set hard. Cut into 2" squares. Can store in an air tight container or fridge. 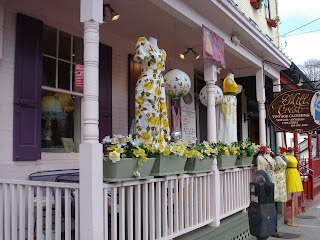 I went to visit my friend Paula who owns a beautiful vintage clothing shop called Mill Crest in Lambertville, NJ today . 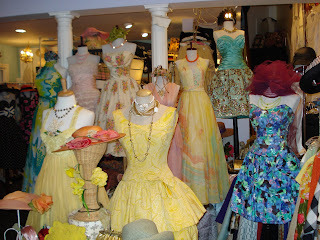 She has the most wonderful collection of vintage dresses, shoes, hats, jewelry and just about anything else for sale. Doesn't the yellow dress outside look like something our new first lady would wear? Neat stuff! !